Learn about check payments at UC San Diego. Checks are a form of payment issued to payees who do not accept any other form of payment. UC San Diego's - Payment Services team is responsible for issuing all non-payroll related payments on behalf of the University. If you need information regarding a paycheck issued from Payroll, see Earnings Statement Overview. To verify check payment status, log in to Payment Compass (login required). To receive a copy of a cashed check, submit a request through ASK (login required). If you do not have Single Sign-On access for ASK, please contact us by email at disbursements@ucsd.edu. Associated document, invoice or travel number if applicable. The turnaround time to receive a copy of a cashed check is 3-5 business days. If a check was lost, torn or issued in error, you may request a cancel/ stop of that payment. The turnaround time to process a cancel/ stop payment request is 3-5 business days. In urgent situations, checks may be canceled and reissued within 24 hours. Checks become stale-dated after 180 days from the payment issue date. Stale dated checks become non-negotiable and can only be reissued with proper permission from the payee. 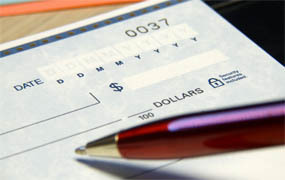 Once a check becomes stale dated, outstanding funds are moved to an internal unclaimed account and payment is canceled. Department funds will not be credited back. This payment is still considered a liability for the University, therefore payment is still outstanding. Payees can request the reissue of an uncashed stale dated check by contacting the correct payment team. If a payee states that their check is stolen and has been cashed by someone other than the payee, the payee will be required to fill out and submit an affidavit to Wells Fargo bank. Wells Fargo will conduct an investigation and provide Disbursements with a resolution. To report a stolen paychecks, contact Payroll at (858) 534-3247. To report a student check stolen, contact Student Business Services, (858) 822-0477. To report all other checks stolen issued by Disbursements, submit a request through ASK (login required). If you do not have Single Sign-On access for ASK, please send the form to us by email at disbursements@ucsd.edu. Wells Fargo will conduct an investigation to determine the status of the reported stolen check and confirm investigation results with Disbursements - Payment Services team. The turnaround time for an investigation for a stolen check can take up to several weeks, this is at the discretion of Wells Fargo. A payment cannot be reissued until the bank determines the status of reported stolen check. Checks are usually mailed on the day they are issued and can take up to 5 business days to be delivered. How can I find out if a check has been issued? Log into Payment Compass to view status of checks issued. Contact the Banking Services team to inquire about a check cashed. How can I find out what address a check was mailed to? Contact the Banking Services team to inquire about where a check was mailed to. How long does a payee have to cash a check? Checks are valid for cashing for 180 days. After 180 days checks become stale dated and will be rejected by the bank. For more information on check payments, contact Banking Services at ASK@ucsd.edu.